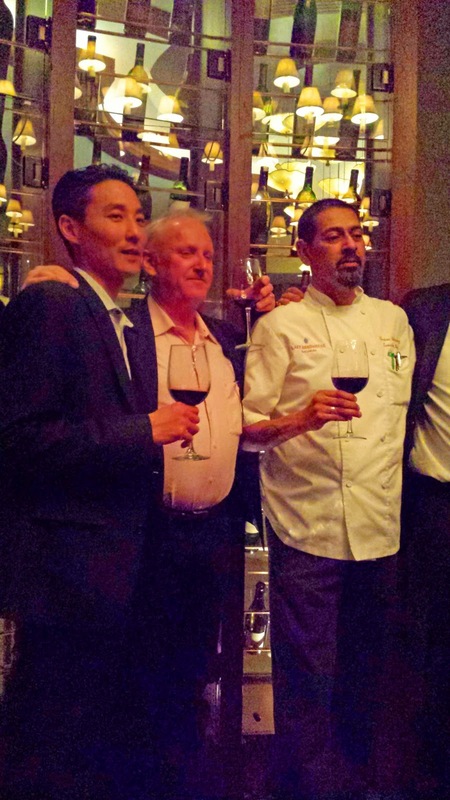 What happens with you put together California wines, and an inspired chef? .....Magic! This night, we gathered at the Lake Arrowhead Resort, high in the San Bernardino Mountains. John Lee, the Food and Beverage manager, had informed me that the co-owner of Michael David Winery would be in town, to host a winemaker dinner with the new Executive Chef, Carmen Rodriguez. The Lake Arrowhead Resort is now a Marriott Autograph Collection property. The new Executive Chef came from the Four Diamond award winning, Fuego at La Posada in Santa Fe, New Mexico. On top of that, Chef Carmen was New Mexico’s Chef of the year in 2012. Michael David Winery is a family owned business of 5th generation growers, dating back to the 1850’s in Lodi, California. David Phillips is the co-owner/President, along with his older brother, Michael. The Family has over 750 acres of vineyards that they own, and also purchases from vineyards throughout California. Many of their labels will be familiar to wine drinkers: 7 Deadly Zins, Earthquake, Freakshow, Petite Petit (the circus label), and Icognito. Their quality wines are sometimes passed up (or in many cases, purchased) because of their eye-catching labels and names. As we gathered in the impressive Magnum Room in the Bin 189 Restaurant, we were offered a glass of Spanish sparkling wine, and the opportunity to talk with David Phillips. We talked about growing grapes in the Lodi region, and how the diurnal temperature changes and the sandy soil make for great wines. Phylloxera hasn’t shown up in Lodi yet, allowing the Zinfandel vines to continue to produce. The Zinfandel vines range from 20 to 118 years old. The Cinsault vines are actually older than 130 years. I know Michael David for their Zinfandels and Petite Petit, but this night, we would experience a full range of their wines. David discussed his wines, and the fact that they have 65 different growers, all following sustainable practices. Of those 65, thirty five of them only grow Zinfandel. Every year, the Zinfandel growers submit their grapes, and each vineyard is fermented individually. All the Zinfandels are blind tasted by the growers (so all 35 taste each other’s wines) and they judge the best. Not knowing whose wine is whose, the winner is picked and that vineyard grower is awarded a bonus. The competition to grow the best grapes, makes for better wine. This night, we were presented with a 7-course meal, all paired with Michael David wines. The interesting thing to me (which is contrary to what I do as a Sommelier) is that Chef Carmen Rodriguez is not a wine drinker. He paired all the courses based on the winery description of the wines, interpreting those descriptions into his food and sauce choices. 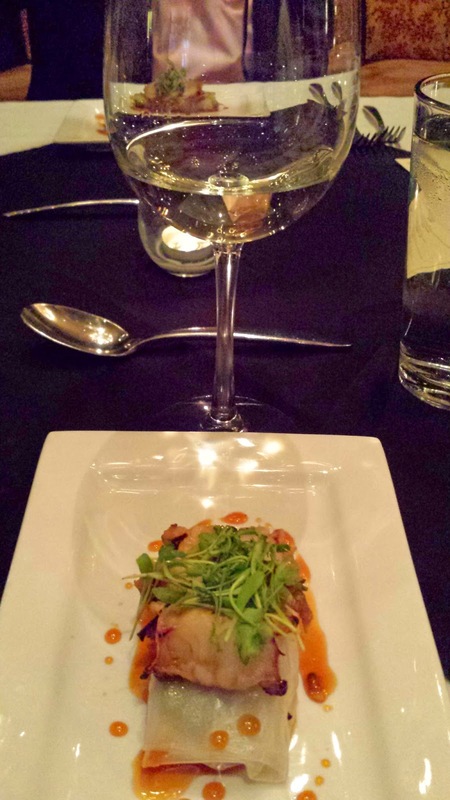 Our first course was a light Grilled Lobster Spring Roll with an Aguadolce drizzle and Wasabi Tobiko. This was paired with the 2013 Michael David Sauvignon Blanc. The grapes were sourced from Lake County, Lodi and Napa Valley (Duckhorn winery). The wine had a nice bright acidity to it, with ripe citrusy fruit flavors. The wine and the grilled lobster worked nicely together, pulling out the subtle caramelization of the lobster. Our second course was Chile-rubbed Seared Diver Scallops over micro greens and a fried plantain with a Sherry, Chipotle Gastrique. This was paired with the 2013 Michael David Chardonnay. I was a bit concerned about the potential heat from the chipotle, but Chef Carmen had used three vinegars and butter to create a coating that kept the heat down. The Chardonnay had been handpicked, taking three passes through the vineyard. It was aged in 100% new oak, and about 40% had been exposed to malolactic fermentation. 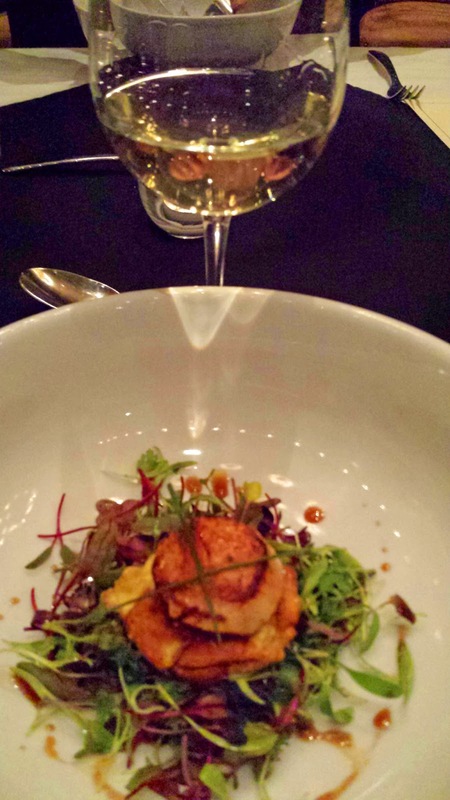 The creamy oak flavors in the wine paired nicely with the butter in scallops. 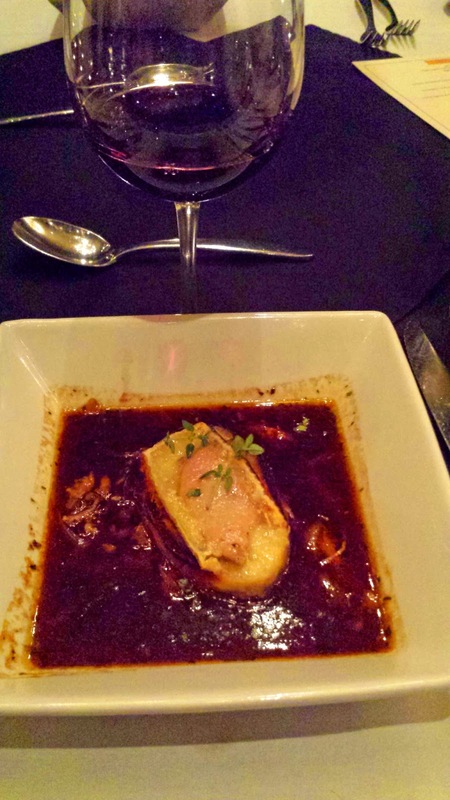 Our third course had everyone talking, a French Onion Duck Confit Soup, served with the 2012 Petite Petit. This rich soup included a foie gras brie crostini. The rich duck and caramelized onions begged for a heavier wine, and the Petite Petit hit the mark with it’s’ blend of 85% Petite Sirah and 15% Petit Verdot. I have enjoyed this wine over the years, and had always wondered about the label. Upon closer inspection, and guidance from David Phillips, the hidden messages were obvious. First, the label was designed by a Grateful Dead fan, so there are references such as the time on the clock, and the lamp stand (which looks like a bong) throughout. Also, all the wines made by Michael David winery are identified on the label (take a look at the top photo on this blog). 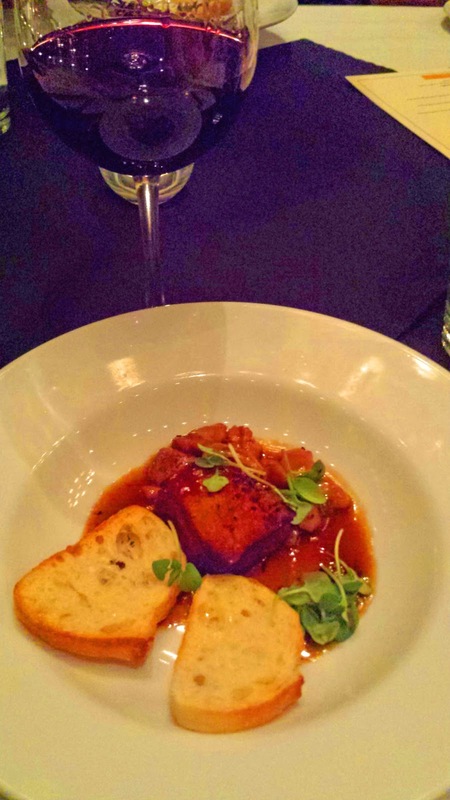 The fourth course was Sweetbreads and crispy pork belly in an herbed wine demi glace. Chef Carmen explained that the sweetbreads were bathed in a milk bath at 97°F, rather than boiled. This was served with the Rapture 2012 Cabernet Sauvignon. The grapes (90% Cabernet Sauvignon & 10% Petite Sirah) for this wine come from Michael David’s own vineyard, and are aged 18 months in 100% new French oak. This is a deep colored Cabernet with notes of blackberry and hints of cocoa. The tannins were smooth for such a young Cab. The fifth course was more of a “palette cleansing” course, and consisted of roasted beets, layered with pine nuts and Chevre. Chef Carmen included local honey along with the sweet roasted beets. This was paired with the Ink Blot 2013 Cabernet Franc. This wine really needs to open up. David noted that the wine was released earlier than planned, due to high demand. Even extensive swirling couldn’t get the wine to open up. Unfortunately, the tightness of the wine was over-powered by the sweetness of the dish. 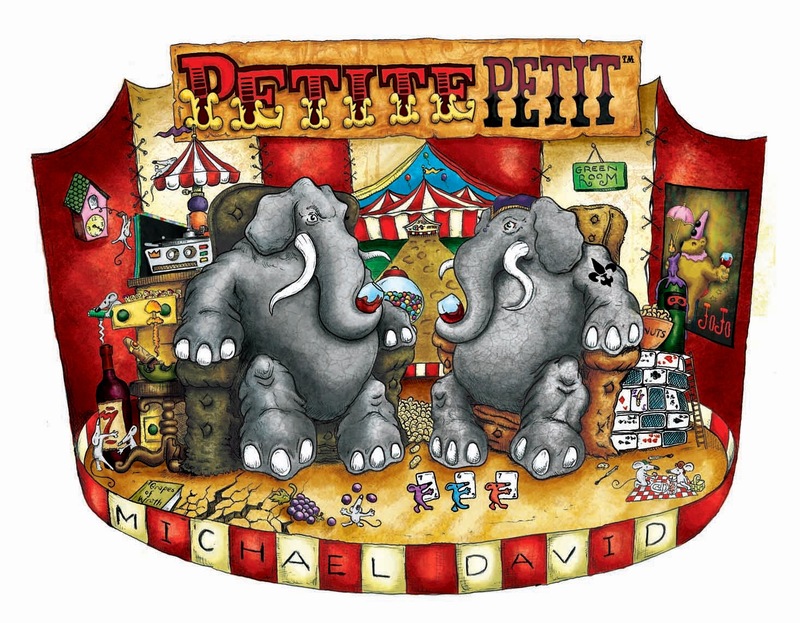 David said that the 2012 Ink Blot would have worked perfectly….but since it is sold out, we may never know. 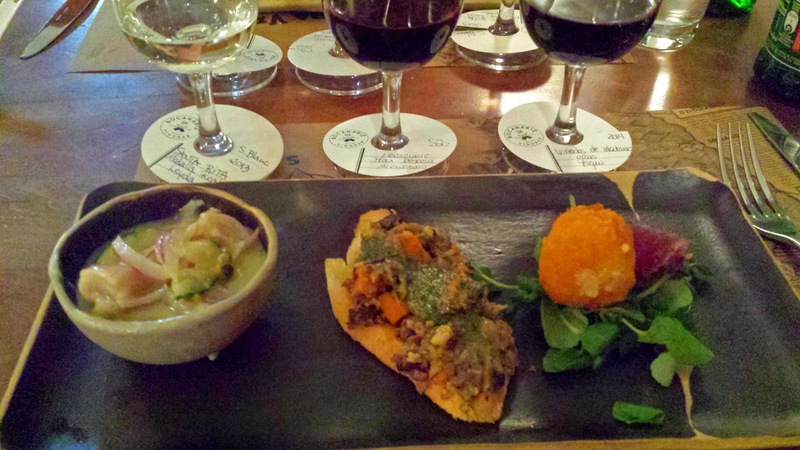 The main course of the evening consisted of three items plated together, and three wines. The first was a lamb ragout, but not just any lamb. Chef Carmen used Halal lamb. He explained that Halal Lamb is slaughtered with a sharp knife by cutting the throat, windpipe and the blood vessels in the neck, causing the animal's death without cutting the spinal cord. Lastly, the blood from the veins must be drained. This prevents the lamb from having the gamey flavors commonly associated with lamb. My wife, who does not care for lamb, said this was the best lamb she had ever had. The lamb was served on top of a Manchego Polenta, and served with the Rage 2012 Zinfandel. This was my favorite pairing of the evening. This Zinfandel comes from 35 year old vines, and has a mix of spice and fruit, that expresses the terroir of the Dry Creek region. The second item was a Lavender rubbed Venison Tenderloin over Rose Petal Risotto and a Mountain Berry reduction, served with the Gluttony 2012 Zinfandel. The grapes for this Zinfandel come from 85 year old vines located in Amador County. 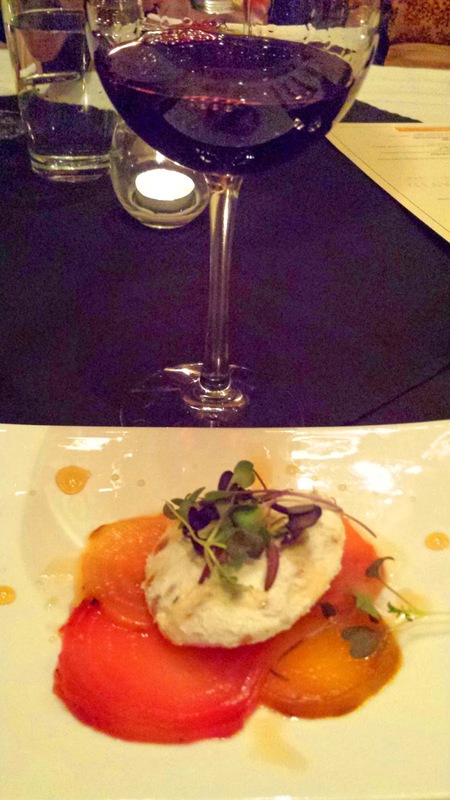 If you read the description of the entrée, then you know the profile of the wine…berries, roses, lavender. The final portion of this course was a Fire-kissed Ribeye with roasted mushroom truffle butter. The ribeye was from Brandt beef, which produces only natural beef (no hormones or antibiotics). This was paired with the Lust 2012 Zinfandel. This wine is produced only from the best Zinfandel lots, and is a big, jammy wine. We ended the evening with a dessert course of Blood Orange Saffron Cheesecake, paired with the Michael David Symphony. 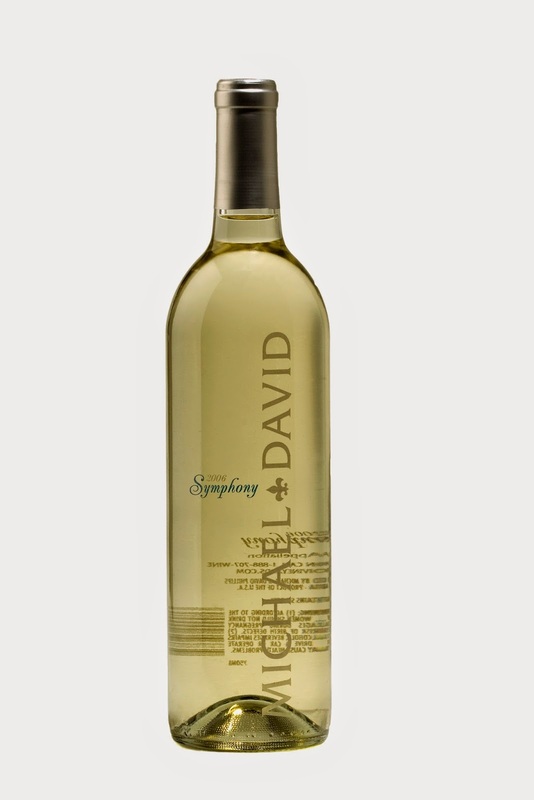 Symphony is a hybrid variety created by crossing Muscat of Alexandria with Grenache Gris. This is not an overly sweet wine, but offered nice aromas of peach and apricot. The moderate plus acidity cut through the creaminess of the cheesecake, making a perfect end for the evening. A couple takeaway notes from this fine evening…Michael David Winery makes some seriously good wines. Look beyond the catchy wine labels, and enjoy their generations of experience. 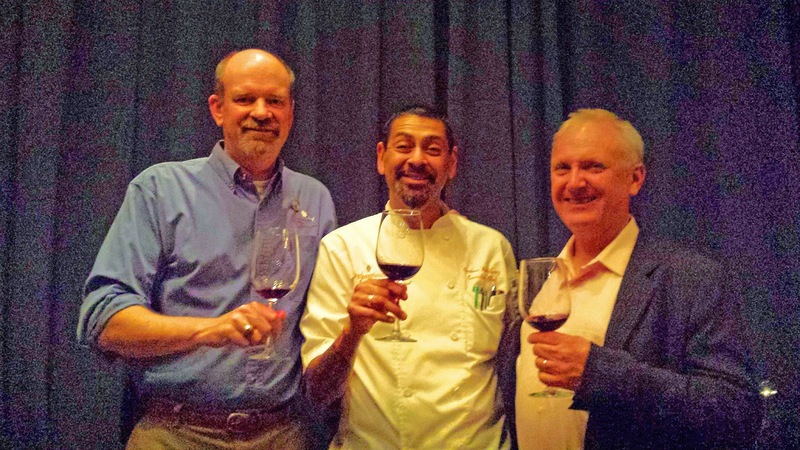 The second note is that the Lake Arrowhead Resort is back as a powerhouse in wine pairing events, with the excellent skills of Chef Carmen Rodriguez. I look forward to future events. But, you don’t have to wait for an event, check out the Lake Arrowhead Resort for your next vacation getaway, and enjoy a dinner at their restaurant: Bin 189. The final segment of our 15 day trip to Chile brought all the pieces together. To understand why Chilean wine is what it is, my previous two article help to figure it out. The first segment of our trip took us to the south of Chile, into the Lake and Patagonia regions. The south has heavy forest, glaciers, fjords and thousands of islands. The second segment of our trip was to the far north, into the Atacama desert…one of the driest places on earth. As we flew from Atacama to Santiago (in the center of the country) we followed along the backbone of the Andes in the east, bordering Argentina. We passed the highest mountain outside of Asia, Aconcagua (22,837ft). On the west is the Pacific Ocean. The wine growing regions of Chile are located in the numerous valleys located between the desert, Andes, ocean, and cold of the south. These barriers, in every direction, have prevented diseases found in other parts of the world, from reaching the vineyards of Chile. Most of the grape vines in Chile are ungrafted, since Phylloxera is not present. Grapes arrived in Chile with the Spaniards, in the middle of the 16th Century. But it wasn’t until the 1850’s that French vine cuttings made their way to Chile, including the grape that has become Chile’s signature grape: Carmenere. The last five days in Chile had us visiting four of the fourteen wine growing valleys, three of the oldest wineries in Chile, a bicycle tour of Santiago, beach communities, great meals, and lots of discussions of history, politics and wishing we could extend our stay. Santiago is a metropolitan city. The highway system rivals any large city in the United States. Metro lines connect the city. The financial district has the tallest building in South America. Our stay at the Marriott Renaissance hotel, was the first place we had internet in the room. Across the highway from the hotel was a modern mall with all the high end retail stores, as well as numerous American restaurants. The day we arrived the temperature was in the mid 90’s. Chile has been suffering through a drought similar to California, and the addition of heat made the air hazy. One of our finest meals was actually at the Catae Restaurant in the hotel. 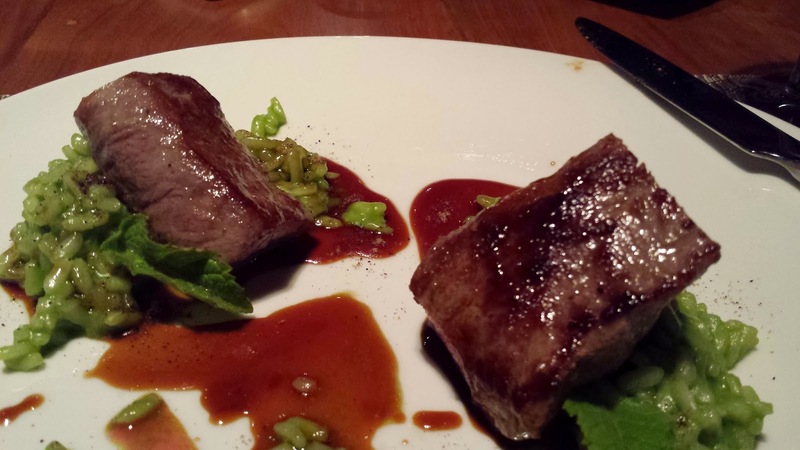 The grilled lamb with mint risotto paired with Morande Cabernet Franc, was something to remember. On Tuesday we grabbed a quick breakfast at the hotel. The buffet was similar to other breakfasts throughout the trip. Those same runny eggs keep showing up. The selection of fruits included “tuna”, which is actually prickly pear cactus. The taste is something like a sweet cucumber with a lot of seeds. We met our guide and driver and headed northwest towards Casablanca Valley. The valley is a small bowl shaped valley with a highway running down the middle. There are currently 13 wineries in Casablanca Valley. The vineyards look similar to vineyards in other growing regions, except the rows and rows of pergola trained grape vines, which are actually only used for table grapes. All the vineyards are on the lower parts of the valley floor, and occasionally part way of the sides of the valley. The upper sides of the valley hills are planted with avocado trees. The vineyards receive their water through channels feeding from the streams and rivers that run out of the Andes. Many of these water channels were built by the Incas, and later by new transplants in the 1800’s. Our first stop brought us back down south a bit, to the northern end of the San Antonio Valley. The Matetic Winery is a biodynamic winery in the small district of Rosario Valley. Harvest had started on the Sauvignon Blanc, and pickers were in the vineyard in the middle of the day. A corral of Alpaca was located next to the vineyard. The Alpaca are used during the dormant season for weed maintenance. Once the fruit ripens, the Alpaca are corralled and chickens are released into the vineyard for insect control. Typically birds are one of the largest pests during harvest time, but there are so many hawks and eagles in the area, birds are not a worry here. After a long lunch (lunches in Chile always seem to go 1 to 1/1/2 hours) at the Matetic Vineyard, we headed to the coastal town of Vina del Mar, then over to the World Heritage section of Valparaiso. We walked from Merry to Concepcion Hill, admiring the street art, small cafes and hostels. This Bohemian section of town reminded me of San Francisco in the 60’s. Wednesday was spent touring downtown Santiago by bicycle. Isabel was the daughter of the owner at www.biketours.cl. For 4 ½ hours we visited monuments, buildings, and unique communities around the capitol. One of stops was the original location of Concha y Toro, which is now a freedom of the press square. After the ride, we visited the Pueblito Los Dominicos, a commune of local artisans, where we found jewelry, paintings, textiles, and bird shops. We found some great prices on Lapis and Chilean silver. After massages at the hotel, we finished the day at the top of the hotel with ceviche in the outdoor bar, and comparing Chilean Pisco with Peruvian Pisco. Thursday morning, we left the hotel just in time to hit the morning traffic, and headed to the Aconcagua Valley. Aconcagua Valley is a small wine growing region about 1 ½ hours north of Santiago. There are only six wineries in the valley, which is fed by the Acongagua river. Our first stop was at the Von Siebenthal Winery. We were the only people at the winery, and met with the owner, Mauro von Siebenthal. The vines are cultivated using organic farming principles and the yield is drastically reduced to intensify the aroma of the grapes. We barrel tasted his Petite Verdot and Carmenere. All his wines take two years in oak and two years in bottle, before release….and it is worth the wait. I was fortunate enough to be able to purchase some wine from the owner’s personal wine library. The wines are seductive, and are a fine example of what a niche winemaker can do. If you see Von Siebenthal wines, buy them! Our next stop was at the historic Viña Errázuriz winery. Where Von Siebenthal was small, Errazuriz (which is just down the road) is huge. We toured the original winery, built in 1870 by Don Maximiano, then toured the new modern facility used exclusively for their “icon” wines. One of the things we noticed about wineries in Chile, they haven’t figured out the gift shop opportunities like those in the United States. Their tastings usually include only three or four wines, and prices are lower if you buy at the winery versus a wine shop (now that is something I’d like to see in the United States). Lunch was at the Caja Los Andes, where we had Churrasco Italiano (a grilled, seasoned beef sandwich with tomatoes, avocados and mayo). Dinner was at one the top rated restaurants in Santiago: Bocanariz. The wine list contains over 400 Chilean wines. The servers are all sommeliers. The restaurant is not fancy, but is very trendy. The wine pairing menu was the recommendation of our server. He paired each course with wines from their list. We arrived at 9:00 on a Thursday night, and left at 11:00, and the place was still packed. Our final day in Chile was spent in the Maipo Valley, just outside of Santiago. This is a flatland area, that is irrigated by the Maipo River. The first stop was Cousiño Macul. They claim to be the oldest operating winery in Chile, established in 1856, and still run by the original family. The walled vineyard estate is now surrounded by homes, and is one tenth the size it used to be. Located at the foot of the Andes, this historic winery is being surrounded by the expansion of the Santiago suburbs. The winery is a museum of wine history. The original underground cellars are still intact, even after some of the large earthquakes that this area is prone to. Lunch was at Tesoros de Chile, where we were the only people in the restaurant. Here we tried a multiple course lunch of traditional Chilean foods. Across the street is the most popular winery in Chile, and most people go there for lunch, and miss this small gem. The Concha y Toro Vineyard was founded by Don Melchor de Santiago Concha y Toro in 1883. Conch y Toro is the largest wine producer in Chile, and they operate differently than the other wineries we visited. They have guided tours that leave the central meeting point, every 15 minutes. Tours of the “summer house” were not allowed this day, as there was a shareholders dinner being set up. The guided tour included a tour of the Casillero del Diablo cellar, which included an almost Walt Disney type show including stories about the devil in the cellar. Concha y Toro also had a huge gift shop, which matched the number of people touring the facility. Unfortunately, every trip has to come to an end, and so did ours (but not before a 13 hour flight back to the United States). Luckily, I was able to bring back some great bottles of wine, that are just waiting for the opportune time to open, and plenty of great memories. 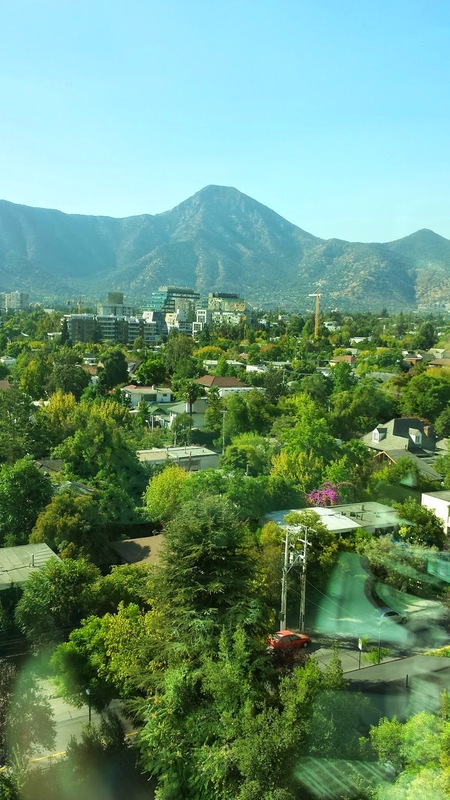 I hope this series of three blogs has inspired you to visit the country of Chile. I know this won’t be our only trip there!